Kubernetes is a powerful container orchestration system that can manage the deployment and operation of containerized applications across clusters of servers. In addition to coordinating container workloads, Kubernetes provides the infrastructure and tools necessary to maintain reliable network connectivity between your applications and services. 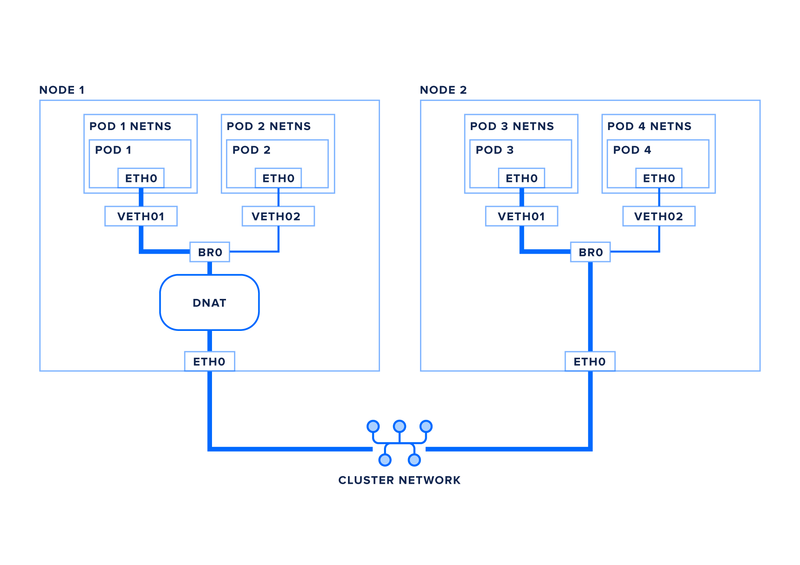 In this article we will discuss how Kubernetes satisfies these networking requirements within a cluster: how data moves inside a pod, between pods, and between nodes. We will also show how a Kubernetes Service can provide a single static IP address and DNS entry for an application, easing communication with services that may be distributed among multiple constantly scaling and shifting pods. If you are unfamiliar with the terminology of Kubernetes pods and nodes or other basics, our article An Introduction to Kubernetes covers the general architecture and components involved. Let’s first take a look at the networking situation within a single pod. 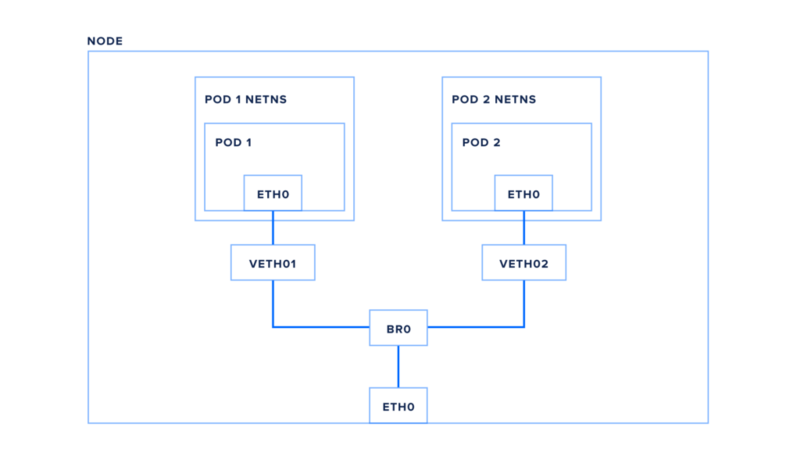 In Kubernetes, a pod is the most basic unit of organization: a group of tightly-coupled containers that are all closely related and perform a single function or service. Networking-wise, Kubernetes treats pods similar to a traditional virtual machine or a single bare-metal host: each pod receives a single unique IP address, and all containers within the pod share that address and communicate with each other over the lo loopback interface using the localhost hostname. This is achieved by assigning all of the pod’s containers to the same network stack. This situation should feel familiar to anybody who has deployed multiple services on a single host before the days of containerization. All the services need to use a unique port to listen on, but otherwise communication is uncomplicated and has low overhead. 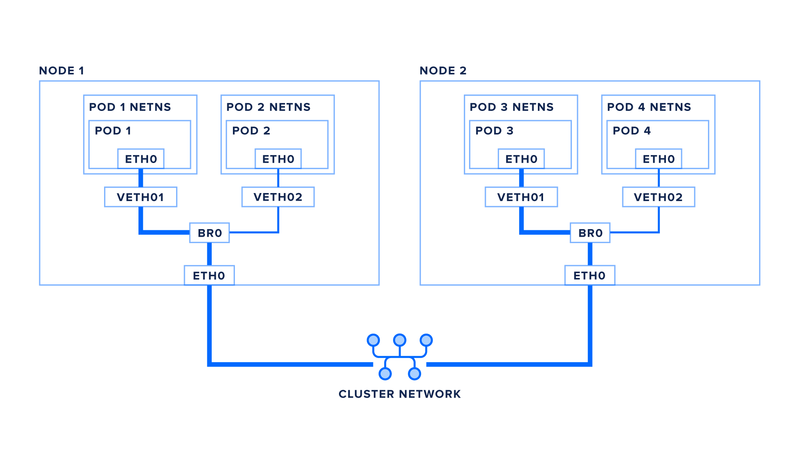 Most Kubernetes clusters will need to deploy multiple pods per node. Pod to pod communication may happen between two pods on the same node, or between two different nodes. 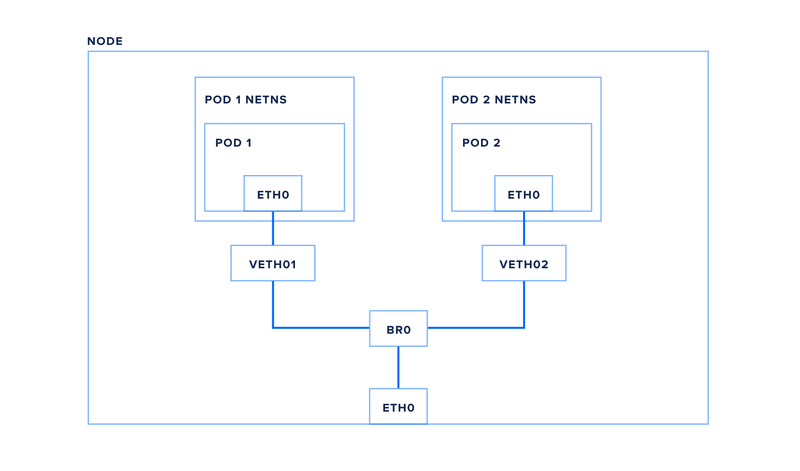 Each node has a network interface – eth0 in this example – attached to the Kubernetes cluster network. This interface sits within the node’s root network namespace. This is the default namespace for networking devices on Linux. Just as process namespaces enable containers to isolate running applications from each other, network namespaces isolate network devices such as interfaces and bridges. Each pod on a node is assigned its own isolated network namespace. Pod namespaces are connected back to the root namespace with a virtual ethernet pair, essentially a pipe between the two namespaces with an interface on each end (here we’re using veth1 in the root namespace, and eth0 within the pod). Finally, the pods are connected to each other and to the node’s eth0 interface via a bridge, br0 (your node may use something like cbr0 or docker0). A bridge essentially works like a physical ethernet switch, using either ARP (address resolution protocol) or IP-based routing to look up other local interfaces to direct traffic to. Now that we’ve traced a packet from pod to pod within a node, let’s look at how pod traffic travels between nodes. Because each pod in a cluster has a unique IP, and every pod can communicate directly with all other pods, a packet moving between pods on two different nodes is very similar to the previous scenario. Optional: if your cluster requires a network overlay to properly route packets to nodes, the packet may be encapsulated in a VXLAN packet (or other network virtualization technique) before heading to the network. Alternately, the network itself may be set up with the proper static routes, in which case the packet travels to eth0 and out the the network unaltered. The packet enters the cluster network and is routed to the correct node. Now that we are familiar with how packets are routed via pod IP addresses, let’s take a look at Kubernetes services and how they build on top of this infrastructure. It would be difficult to send traffic to a particular application using just pod IPs, as the dynamic nature of a Kubernetes cluster means pods can be moved, restarted, upgraded, or scaled in and out of existence. Additionally, some services will have many replicas, so we need some way to load balance between them. Kubernetes solves this problem with Services. A Service is an API object that maps a single virtual IP (VIP) to a set of pod IPs. Additionally, Kubernetes provides a DNS entry for each service’s name and virtual IP, so services can be easily addressed by name. The mapping of virtual IPs to pod IPs within the cluster is coordinated by the kube-proxy process on each node. This process sets up either iptables or IPVS to automatically translate VIPs into pod IPs before sending the packet out to the cluster network. Individual connections are tracked so packets can be properly de-translated when they return. IPVS and iptables can both do load balancing of a single service virtual IP into multiple pod IPs, though IPVS has much more flexibility in the load balancing algorithms it can use. Note: this translation and connection tracking processes happens entirely in the Linux kernel. kube-proxy reads from the Kubernetes API and updates iptables ip IPVS, but it is not in the data path for individual packets. This is more efficient and higher performance than previous versions of kube-proxy, which functioned as a user-land proxy. When the packet returns to node1 the VIP to pod IP translation will be reversed, and the packet will be back through the bridge and virtual interface to the correct pod. In this article we’ve reviewed the internal networking infrastructure of a Kubernetes cluster. We’ve discussed the building blocks that make up the network, and detailed the hop-by-hop journey of packets in different scenarios. For more information about Kubernetes, take a look at our Kubernetes tutorials tag and the official Kubernetes documentation.